As from now Fisherman Holidays also accepts on-line payments. We preferred the Dutch payment processor company Mollie for handling the payments. The platform accepts credit and debit card payments from customers from anywhere in the world. The payment system allows us also to quickly and easily accept payments through iDEAL, the most used payment method in the Netherlands, Bancontact (Belgium), Sofort (Germany), ING Home'Pay and many other payment methods. We think this is a big improvement for our UK-customers: no more bank transfers, no more (ridiculously) high transfer fees, no more hassle with exchange rates. 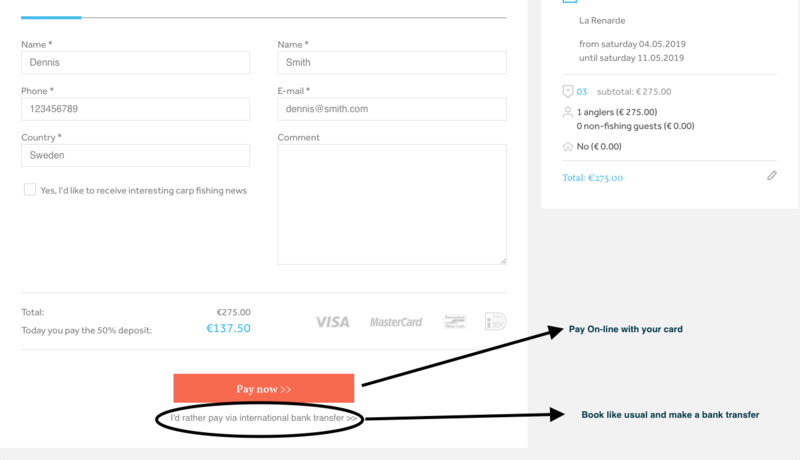 If you prefer to book like you were used to, paying for your booking with an international bank transfer, you simply click on the link below the "Pay now"-button (see pictue below).